Last Saturday, when I was supposed to be out running 18 miles at my long slow distance with my training group…I was instead at Iroquois Park, gearing up for a small 5K race that I run every year. It was important to me, and it did mean shifting the schedule around. Normally this would have meant I’d just meet up with someone on Sunday instead, but much of my group was volunteering at one of the water stops at the Louisville Ironman…so it meant my 18 mile run would be done solo…and I’d keep it on the Indiana side of the river instead of taking it over to Louisville. No problem. I mapped it out so I had a route, and actually memorized it without a problem. That’s quite unusual for me. I’m such a scatterbrain at times. But this stuck. Maybe because the long runs are the foundation of my training plan and the runs I look forward to the most. I’ll be honest though…I wasn’t looking forward to this one. 18 miles would take me around 2 hours and change to complete…and that was if the elements were ideal. And on Sunday morning, it was a humid morning in the high 60s…and once that sun came up…it was hot. I had jokingly suggested that my roommate, Cathy, ride her bike and shadow me on my 18 mile run. Since this run was done on a route that wouldn’t take me back near my apartment, nor really around to any water fountains (they aren’t readily available around here like they are in Louisville), I figured she could be my roving water stop. She actually seemed game for it, despite being worried about taking on the hills. I figured she had plenty of time all week to back out of it…but she never made any indication that she intended to do that. On Saturday night, I asked if she was really going to come along. She said she was…and seemed adamant about it. So…for the first time ever, she got to see me through an entire run. And at the end…I was glad she was there to push me to finish strong. This week would normally be a taper week…as I have a half marathon next Sunday…but my main focus is on the marathon. It just so happened that this week required a 13 mile run, so the training schedule fell right into place. I couldn’t have asked for a more perfect alignment. But…no taper was happening. And I promised my sports nutritionist not to all-out race this half marathon and keep it at my training pace. So…I hope I can manage to keep myself from getting carried away. Guess time will tell. That being said…let’s take a look at how this week shook out leading up to the Disneyland Half Marathon. 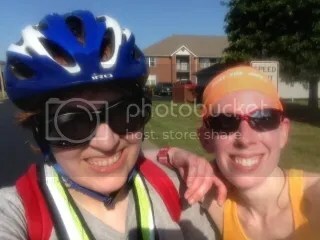 Cathy and I after our 18 mile adventure! Sunday, while normally was the “Do What Feels Good” distance or rest day…it wasn’t happening this week. As I mentioned, my usual long run day on Saturday was replaced with a short 5K race. I rocked the race, but it meant the long run had to be pushed to Sunday. I was a bit unhappy with the dramatic drop in my mileage for the week because of the 5K…but…I’m not overly concerned now. I’m doing the work…and that’s the important factor here. Anyway, I got up early to get ready and slap on some sunscreen before the sun even came up. I ate my usual breakfast of cereal…no banana today because I didn’t have one and forgot to pick one up. No worries. I packed three GU packs in my skirt and started to fill up my water bottles with NUUN. My roommate was up and moving, making it even more likely that she was at least going to start this adventure with me. I was fairly certain she’d ditch it after the first couple of miles. I got her suited up in my reflective vest and she ate a quick breakfast and went to pump up the wheels of her bike. We were waiting on the sky to lighten up just enough to feel safe out on the roads. She put on her bike helmet and hauled her bike down. I went to get warmed up, as usual, with a slow mile through the apartment complex parking lots. And soon…after she added more air to her tires…we were hitting the road. At first, she had some trouble actually shadowing me…but she got the hang of it. And she did a fantastic job seeing me around New Albany, biking the entire time and either being just slightly ahead of me, or just behind. And, let me tell you, one of the best things in the world is hitting your final mile on a hot day where you just want to STOP…and hearing this slightly off-pitch voice start singing the Rocky Theme at you…followed by other inspirational songs. She even botched Queen lyrics, making me laugh. It was fantastic and when my watch hit 18 miles, we high fived and called it a day. I was so proud of her for making the entire 18 mile journey with me. She never complained once and she was always asking at stop lights if I needed the Sports Beans I had her take just in case…more NUUN…or more water. She now has a good idea of what I do on my long runs and I quite enjoyed having a roving water stop…and my own personal radio of inspiration at the very end. I got through that run because of her. Monday…ah…Monday. My training schedule called for 7 miles…but with my upcoming week of craziness…I bumped it up to 8 miles. This also meant that I needed to get up a wee bit earlier to get the run done. So, at 3:30 a.m., I’m up and getting dressed, eating a light bite and downing 16 ounces of water. I had hoped to hit the ground running early, but I spent about 15 minutes searching for my reflective vest that I had let my roommate wear the day before. I couldn’t find it anywhere. So, finally, I grabbed my winter reflective vest and headed out to run. The winter reflective vest was super, super hot and the morning was warm (74 degrees) and humid. And it was just after 4 a.m. I started out, and immediately found that the vest was just too much. But, I needed to be seen, so I kept it on. My roommate later showed me she hung it up on my drying rack…on the back part that I couldn’t see. At least I know it’s there for tomorrow. Anyway…it was a miserable and slower 8 miles this morning. My legs were feeling the 18 mile hot run on Sunday…and the dehydration I think the vest was causing me. I hydrated (with Gatorade and water) every mile…but it was a struggle to get through this one. I managed. Needless to say, Monday is, of course…the weekly Daily Double. Most of the group wanted to run trails…but Natalie said she ran trails last week. She recommended hills due to all my bitching about not running them, but I ran hills at the race on Saturday and then everywhere I turned on Sunday. So, we opted to run one of our fun run routes backwards…not even going inside Cherokee Park. What came of this was a nice, relaxing, easy 3.6 mile run that felt awesome. And the company of Natalie and Harry was perfect. Once again…we talked about lots of things, but I got to talk to Natalie about Celiac and gluten intolerance and how we just like to eat…all…the…food. For the second run of the day, it sure did feel good. Wednesday is the speed work/pacing day. And this Wednesday meant…speed work. Since school is back in session, I can’t get over to the track to bust out my work…so this meant hitting up the gym and getting it done…on the treadmill. This might have been a blessing this morning as the humidity was just…stifling and the air was hot, hot, hot. I still dislike doing treadmill work, but got up early, grabbed a bite, then went to the gym to get my speed work done. I always keep in mind never to push faster than I would normally run if I were running these sprints on the track. Keeping that in mind, I had 8 miles total to do…2 mile warm up, then 3 x 1600 meters with 2 x 800 recovery, then a 2 mile cool down. I made sure I was stretched and warm before I even started because the worst thing to do when working on speed work…is to do it with cold muscles. That is a recipe for injury. I hit the 1600s hard and fast and made sure I had an easy recovery in between. My 8 miles was done in 1:03:36, which isn’t bad considering the 4 miles of warm up and cool down I did at a much slower pace than I would normally run on my own. I was pleased with it. But, I am so out of practice on the treadmill (not a bad thing! )…that I kept hitting my pinky against the bar and now it’s rather bruised and a bit swollen. Sort of hurts to bend too. MEH! Yuck. Went home and did the last day of Level 2 of the circuit training required for the week before the trip. When I get back…boosting it up to the next level. Sort of fearing that and looking forward to it. Thursday ushered in another easy run day. This was, once again, supposed to be 7 miles, but I bumped it up to 8, just like I did on Monday and yesterday with the speed work. I’m heading out of town on Friday afternoon, so going a few extra miles before taking Saturday completely off was part of the plan early in the week. That’s why I ran on Tuesday, which is normally just cross-training. Let me tell you…the humidity and heat this morning was horrible. At 3:30 a.m…when I headed out the door to run, it was 78 degrees with 86% humidity and a 70 degree dew point. Already my legs were exhausted from my 8 mile speed work and circuit training from the day before, but I told myself just to run easy. I didn’t want to push too hard in this kind of weather, nor did I want to risk injury by pushing too much on tired legs. So…I just ran an easy-peasy 8 miler, remembering to hydrate often (with both Gatorade and water) along the way. It took just over an hour and was close, but just slightly slower than my Monday and Wednesday runs. So, I don’t feel too bad about that. I tend to take my Thursday runs easy anyway because it also is another morning at the gym. The morning was all about hustling to get to the gym a little earlier than usual. Like I said…I’m heading out of town this weekend, so I’m working a bit more at the office to make sure I have everything in order and done. The gym schedule had me on the Octane Fitness 4700 Elliptical Machine…which is really more of a cross trainer than anything. Which might be why I love it so much. It is really a full-body workout on this machine. Upper and lower body get worked and it has various programs to choose from. I usually just do the Loop program, Level 7, and just go with it. But, I think after Chicago, I might try some of the other options on there. Anyway, I managed 8.97 miles in 49 minutes, which isn’t too shabby on these tired legs. From there it was over to the Cardio Wave machine to work these legs a little more, but get them moving in a different direction. Managed 3.97 miles on that in 10 minutes, which is a new record for me. I had it set for Level 13 instead of varying the resistance throughout. Figured I’d keep a steady rhythm for a little more of a challenge. It was definitely a challenge. After that, it was downstairs to hit up a few strength machines before heading in for a long, long day at the office. Friday is normally my rest day…which I always try to respect and keep holy. However, Saturday is going to be my “rest” day…if you can call it that. In a couple of hours, I’ll be heading to the airport to fly out to Los Angeles, CA. The best part of this trip…hanging with my GIRLS!! Indy and Tawn are both going to be there and it has been quite a few years since our last encounter. Well. the four of us (Indy, Tawn, Cathy and myself). I got to see Indy at the Disney World Princess Half Marathon back in February. But…no Tawn. So…it’s happening. Both Indy and I are participating in the Disneyland Half Marathon on Sunday. So, with Saturday being a day of rest…I figured I could venture out and do a bit of a shake-out run before the long day of travel ahead. And that’s exactly what I did. Once again, the morning greeted me with temperatures in the high 70s. It was 75 degrees at 3 a.m. The humidity was at 81% as well, making it…oh, just so enjoyable. Everyone loves running in a sauna, right? Right? Yeah…not so much. For the first 4 miles, I was pulling a good pace though. The only problem was…my usual running clothes were packed for my trip to California and Colorado…so I was wearing shorter running shorts than usual…and the mace I carry with me was smacking against my thigh. I didn’t notice. HOW I didn’t notice, I still don’t know. But…when it finally hit me that my leg was hurting, I realized my mace had now given me a nice welt and bruise on my right thigh. Lovely. I stopped and moved the mace further back on fuel belt and that fixed the problem. Finished out the run and even did it with negative splits. It was also my fastest run this week. Not too shabby for a blech kind of morning. I showered. I foam rolled. I finished up packing and headed into work. Getting ready to head out to the airport. California bound. Doing Disneyland with my GIRLS!! Saturday is normally my long run day, but as I am racing in the Disneyland Half Marathon on Sunday, Saturday is my day of rest. This actually works out since my training plan called for 13 miles this week (it’s a step-back week on mileage). So, instead of running, I’ll be hitting up the race expo, and seeing some of what Disneyland has to offer with Tawn, Indy, and Cathy. And let me tell you…I totally can’t wait. Running the Disney Princess Half Marathon back in February at Disney World was so much fun, I can’t wait to see what sights, sounds, and adventures Disneyland holds! This entry was posted in life, mile markers, running, training by The Celiathlete. Bookmark the permalink.